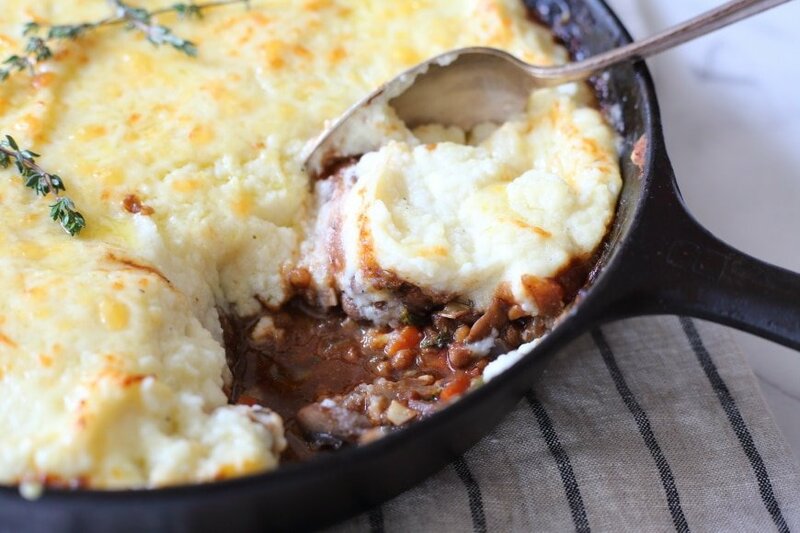 You won’t miss the meat in this hearty but healthy lentil shepherds pie! The first time I made this lentil shepherds pie, James looked up from his bowl with stars in his eyes and told me he loved me. Or, maybe he said he loved it. Whatever. I was shimmying in my chair and distracted (if you haven’t noticed by now, good food makes me dance!). 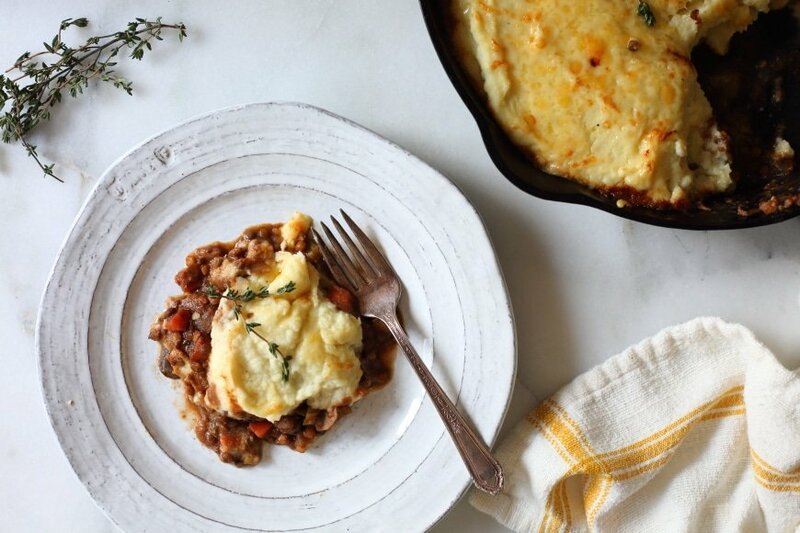 A rich base of wine-simmered lentils, mushrooms and vegetables gets capped with an ultra creamy cauliflower and parsnip crust, and the whole shebang is topped with a melted layer of Gruyere cheese. 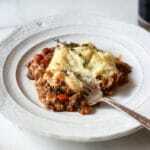 It’s the ultimate comfort food, and yet it won’t make you pass out after dinner. (You should dance instead, duh). 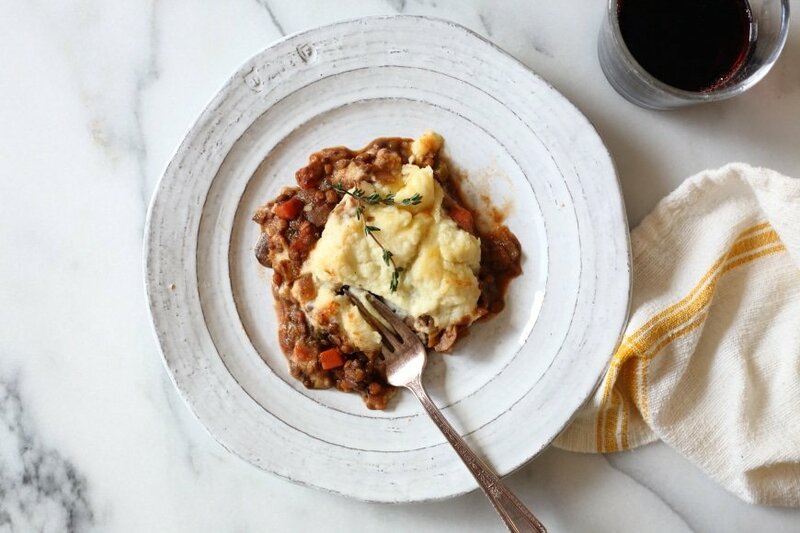 Instead of using meat, this shepherds pie gets its heft from lentils. I recently discovered store-bought vacuum-sealed cooked lentils, which are a huge time saver (best idea ever!). 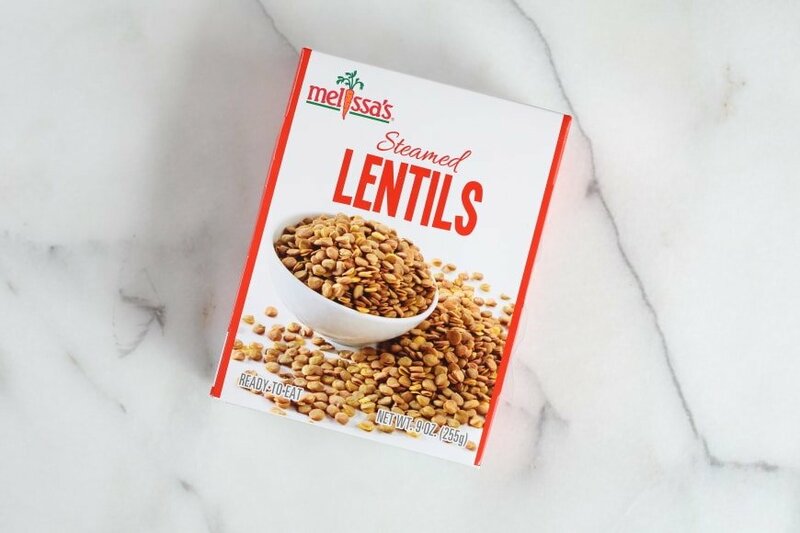 I use Melissa’s brand, which are now widely available (they’re usually found refrigerated in the produce section). If you can’t find them, however, don’t despair! Cooking lentils from scratch is a cinch, and I include instructions in the recipe notes below. I’ve been on a cast iron skillet kick recently. There’s nothing better in winter than placing a warm skillet in the middle of the table that’s brimming with delicious food (especially since most cast iron meals are easy one-pan situations). 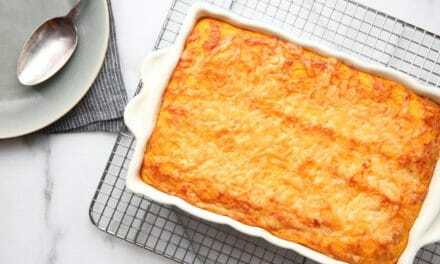 We’ve been noshing on this chili millet bake, this roast chicken and this warm corn dip. I even did a Facebook live video for Fine Cooking magazine all about cast-iron cooking, where I made a lamb shepherd’s pie. 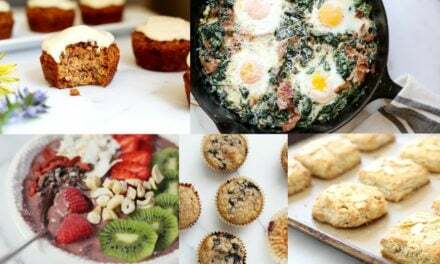 I’ve listed some of my other cast iron favorites below. 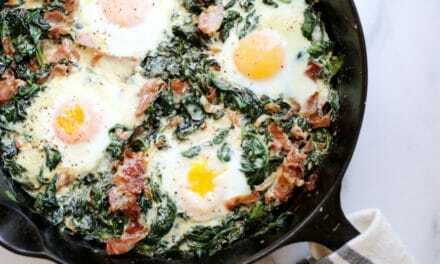 What are your favorite cast-iron meals? 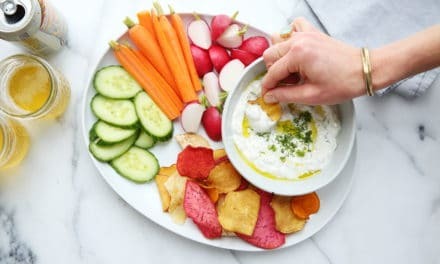 *Melissa’s Produce kindly provided the lentils for this post, but I was not compensated for the post, and all opinions/recipes are my own. 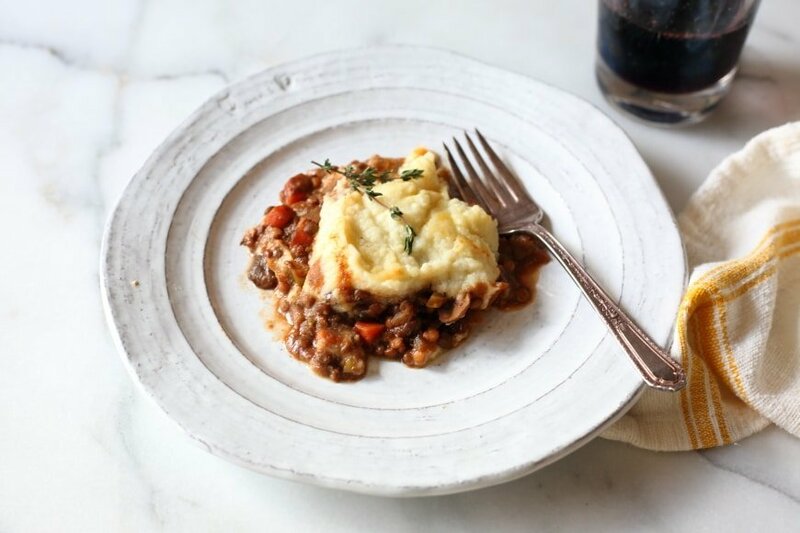 This shepherd’s pie is nourishing and nutritious, but it tastes darn right indulgent. 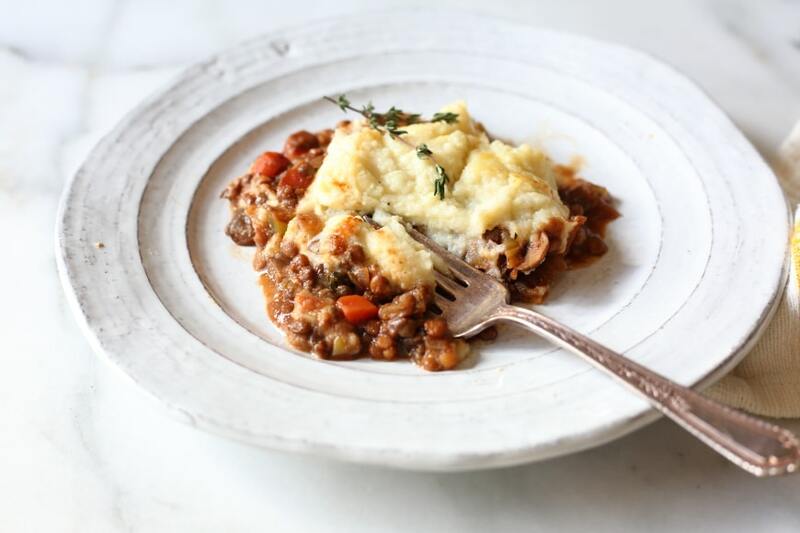 A rich lentil and mushroom stew gets topped with a creamy cauliflower and parsnip puree and is then capped with a melted layer of Gruyere cheese. It’s a satisfying main course or a gorgeous side dish (it’s also great for potlucks, as it travels well and can be reheated). This recipe calls for packaged steamed lentils, which are a huge time saver. However, you can absolutely cook your own lentils—see the notes below for instructions. A touch of truffle oil lends umami richness, but you can omit it if preferred. Make sure your cauliflower is right around the two-pound mark for the best consistency in the topping. Place the garlic clove and parsnip in the bottom of a medium saucepan, and pour in the milk. Pile the cauliflower on top, and season with salt. Bring the milk to a boil over high heat. Reduce the heat to a simmer, cover and cook, stirring occasionally, until the cauliflower is very tender, about 20 minutes (while the cauliflower cooks, prep the filling). Transfer everything from the pot (including the liquid) into a food processor and add the butter. Process until smooth and creamy. Add the lemon juice, and process to incorporate. Season with salt as needed. Heat the oil in a 10-inch cast iron or oven-proof skillet over medium-high heat. Add the onion, carrots and celery, and season with salt and pepper. Cook, stirring occasionally, until the vegetables are tender, about 5 minutes. Add the mushrooms, and season with more salt and pepper. Cook, stirring occasionally, until the mushrooms are softened, about 5 minutes. Add the tomato paste, garlic and thyme, and cook, stirring, until everything smells heavenly, about 1-2 minutes. Stir in the lentils, and season with salt and pepper. Pour in the wine and bring to a boil, scraping up any bits from the bottom of the pan. Cook until the wine is almost completely evaporated, about 1-2 minutes. Add the broth and bring to a boil. Cook until slightly thickened, about 1 minute longer. Remove the pan from the heat, and stir in the sherry vinegar, sugar and truffle oil (to taste). Taste and season with salt and pepper as needed. 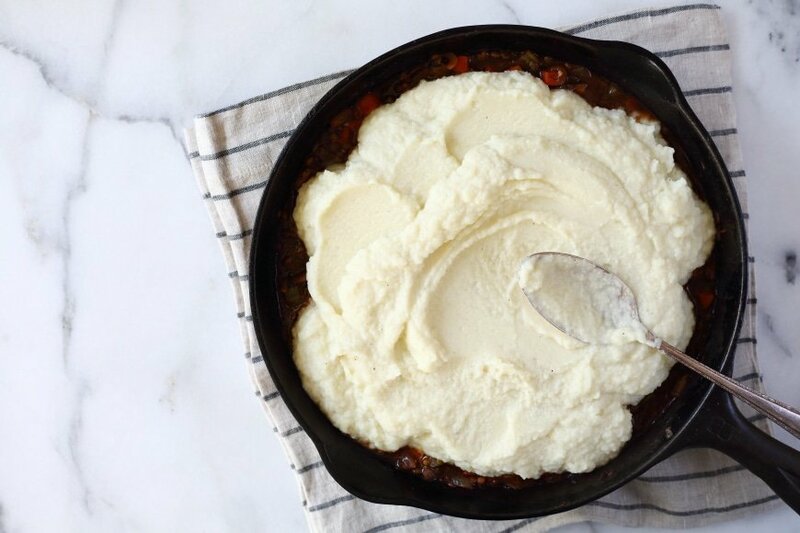 Spoon the cauliflower puree over the filling and spread in an even layer. Sprinkle with the cheese. Broil on the top rack until bubbling and golden, about 5 minutes. Let cool 5 minutes before serving. The cauliflower puree can be made up to 1 day in advance. Bring it to room temperature before using. To cook lentils, place 1 cup of green lentils (preferably Le Puy lentils) in a medium pot with 4 cups of water (feel free to add aromatics, such as a smashed garlic clove, a parsley sprig and/or a bay leaf). Bring the water to a boil, then reduce the heat to a simmer. Let cook 15-20 minutes, or until the lentils are tender but not mushy (they should still have a slight bite). Drain. (This will yield more lentils than you need for this recipe—use leftovers in salads or freeze them for meals down the line). 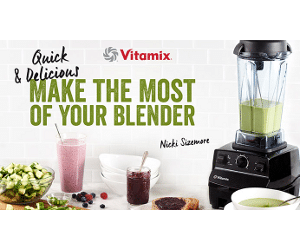 Nicki – can you substitute a different vegetable for the mushrooms? Hi Kathy, yes! I suspect chopped zucchini would work well, and finely chopped butternut squash would also be delicious (you would just need to cook it a bit longer, until tender). Let me know if you give it a try!